How to restrict the set of characters that the user can type or paste into a Tk or tile entry, BWidget Entry, Tk or tile spinbox, tile combobox, text, or ctext widget? How to manipulate the user input characters before they are inserted into one of these widgets? 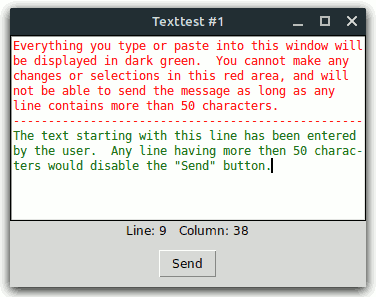 In the case of a text or ctext widget: How to change the font, colors, or other attributes of the input characters? How to set a limit for the number of characters that can be typed or pasted into a Tk or tile entry, BWidget Entry, Tk or tile spinbox, or tile combobox widget? How to protect some parts of the text contained in a Tk or tile entry, BWidget Entry, Tk or tile spinbox, tile combobox, text, or ctext widget from being changed by the user? How to define notifications to be triggered automatically after text is inserted into or deleted from one of these widgets? How to define some actions to be invoked automatically whenever the insertion cursor in a Tk or tile entry, BWidget Entry, Tk or tile spinbox, tile combobox, text, or ctext widget is moved? How to define a command to be called automatically when selecting a listbox element, a tablelist row or cell, a tile treeview item, or a range of characters in a text or ctext widget? How to protect any or all items/elements of a listbox, tablelist, or tile treeview, or a range of characters in a text or ctext widget from being selected? In most books, FAQs, newsgroup articles, and widget sets, you can find individual solutions to some of the above problems by means of widget bindings. This approach is based on adding new binding tags or modifying some of the existing ones, which quite often proves to be incomplete. The Tk core addresses just a few of the above problems: In Tk 8.1 the <<ListboxSelect>> virtual event for listbox widgets was introduced, Tk versions 8.3 and higher support widget options for entry validation, and the spinbox widget (introduced in Tk 8.4) provides the same validation facility. Finally, Tk versions 8.4 and higher support the disabled state for listbox widgets, as well as the modified flag, the <<Modified>> and <<Selection>> virtual events, and an undo/redo mechanism for text widgets. However, also these improvements are of individual nature. The Widget callback package Wcb provides a completely different, general solution to the above problems: Based on redefining the Tcl command corresponding to a widget, the main Wcb procedure wcb::callback enables you to associate arbitrary commands with some Tk entry, tile entry, BWidget Entry, Tk spinbox, tile spinbox, tile combobox, listbox, tablelist, tile treeview, text, and ctext widget operations. These commands will be invoked automatically in the global scope whenever the respective widget operation is executed. You can request that these commands be called either before or after executing the respective widget operation, i.e., you can define both before- and after-callbacks. From within a before-callback, you can cancel the respective widget command by invoking the procedure wcb::cancel, or modify its arguments by calling wcb::extend or wcb::replace. Besides these (and four other) general-purpose commands, the Wcb package exports four utility procedures for Tk entry, tile entry, BWidget Entry, Tk spinbox, tile spinbox, and tile combobox widgets, as well as some before-insert callbacks for Tk entry, tile entry, BWidget Entry, Tk spinbox, tile spinbox, tile combobox, text, and ctext widgets, which you can use unchanged or modify to suit your needs. To learn how to do this, have a look at the Examples section below. The Wcb package is implemented in pure Tcl/Tk code, which makes it completely platform-independent and very easy to install. It requires version 8.0 or higher of both Tcl and Tk. The distribution file is wcb3.6.tar.gz for UNIX and wcb3_6.zip for Windows. 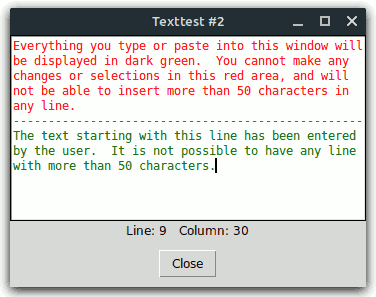 These files contain the same information, except for the additional carriage return character preceding the linefeed at the end of each line in the text files for Windows. Install the package as a subdirectory of one of the directories given by the auto_path variable. For example, you can install it as a directory at the same level as the Tcl and Tk script libraries. The locations of these library directories are given by the tcl_library and tk_library variables, respectively. This command will create a directory named wcb3.6, with the subdirectories demos, doc, and scripts. On Windows, use WinZip or some other program capable of unpacking the distribution file wcb3_6.zip into the directory wcb3.6, with the subdirectories demos, doc, and scripts. Notice that in tklib the Wcb demos directory is replaced with the subdirectory wcb of the examples directory. Please take this into account when reading the examples below. You are free to remove one of these two lines from wcb.tcl if you want to prevent the package from making itself known under two different names. Of course, by doing so you restrict the argument of package require to a single name. Please note that ActiveTcl versions 8.5 and later use a modified package mechanism, which only exports the all-lowercase name wcb. For this reason, the examples below use the statement package require wcb. namespace import wcb::pattern ?wcb::pattern ...? command to import the procedures you need, or use qualified names like wcb::callback. In the examples below we have chosen the latter approach. The variable wcb::version holds the current version number of the Wcb package. The variable wcb::library holds the location of the Wcb installation directory. This last example also shows the arguments of the callbacks declared with the wcb::callback command: Whenever a callback is invoked, the name of the original Tcl command for the widget as well as the arguments of the respective widget operation are automatically appended to it as parameters. Since we defined checkNumber as a before-callback for the insert subcommand, its last three arguments must be: the name of the original entry widget command (w), the index (idx), and the string (str) to be inserted just before the character indicated by the index. Notice that in the argument list of a Wcb callback, the name of the original Tcl widget command can be be preceded by any number of additional arguments. The procedure wcb::checkEntryLen is an example of such a callback. The command wcb::postInsertEntryText invoked in the procedure checkNumber returns the text that would be contained in the entry widget w after inserting the string str before the character indicated by the index idx. If this text is not (the starting part of) an unsigned real number with at most two digits after the decimal point, then we call the procedure wcb::cancel, which aborts the insert command. In the case of a listbox, you will probably most often want to define a callback for the selection set widget subcommand. In most cases it does not matter whether this is a before- or after-callback. Please note that the wcb::callback command expects the abbreviated form selset as parameter. Similarly, you must pass selclear to this command when defining a callback for the selection clear listbox operation. 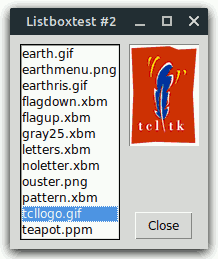 In the following example we build a listbox .lb containing the names of the bitmap files in the subdirectory images of the directory demos in the Tk library directory. Whenever an item is selected, the callback procedure showBitmap will display the corresponding bitmap in the label .picture. Recall that the selection set listbox operation takes as arguments one or two indices, which will be passed automatically to the callback as parameters, along with the name of the original Tcl command associated with the listbox widget. For this reason, the arguments of the callback procedure showBitmap are: the name of the original listbox widget command (w), the first index (first), as well as the args keyword representing the empty list or the optional second index passed to the selection set command. 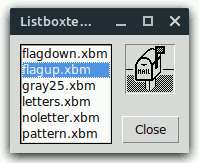 The listbox used in the preceding example has the default selection mode browse, hence the before-selset callback showBitmap will be fired every time the mouse is dragged from one element to another, with button 1 down. But what happens if we want to display not only the bitmaps but also the photo images contained in the subdirectory images of the directory demos in the Tk library directory? Loading a photo image is a much more complex operation than loading a bitmap, which can have the effect that some images cannot be displayed quickly enough to follow the mouse when browsing with it within the listbox. .picture configure -bitmap @$pathName -image ""
wcb::callback .txt  after insert "checkLines $width"
wcb::callback .txt  after delete "checkLines $width"
# or as "from ?to from to ...?" (for a selset callback). # callback) and as "from ?to?" (for a delete callback). The procedure protectRedArea is a before-insert, before-delete, and before-selset callback. It checks whether the attempted change would affect the text area displayed in red; if this is the case, it calls the procedure wcb::cancel, which aborts the insert, delete, or tag add sel command, respectively. The before-insert callback changeColor invokes the wcb::extend command to append the user tag to the argument list of the insert command, thus changing the foreground color of the characters entered by the user to DarkGreen. The procedure displayPos displays the line and column corresponding to the index passed to it as its second argument. This index will be the target position of the insertion cursor when the procedure is triggered automatically as a before-motion callback. As seen in the checkLines procedure discussed below, it is also invoked after performing an insert or delete operation; in that case, its second argument will be the new position of the insertion cursor after the execution of insert or delete. In this way, we are able to keep track completely of the position of the insertion cursor. 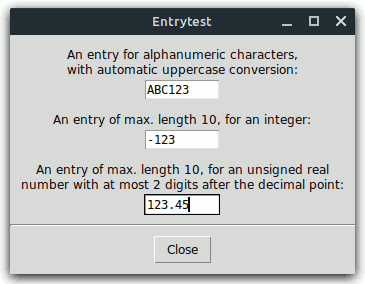 The reason is that the value of the idx argument passed to displayPos can be, for instance, insert+1c, where insert means the position of the insertion cursor before moving it forward by one character. The after-motion callback is, however, triggered after the insertion cursor has been moved, and at that time the insert mark already points to the new cursor position. For this reason, [$w index $idx] is not adequate to retrieve the position of the insertion cursor within an after-motion callback. Our last procedure checkLines is both an after-insert and after-delete callback. After calling displayPos to display the new cursor position, it disables or enables the .send button, depending upon whether any line of the text widget contains more than $maxCharsPerLine characters. Notice that we could also have defined before-replace and after-replace callbacks for the replace text widget subcommand, introduced in Tk version 8.6. There is, however, no need for it, because the default text widget bindings currently don't make use of this subcommand. This version of the callback checkLines undoes the last edit action if any text line contains more characters than the allowed maximum. For this reason, we had to move the invocation of the displayPos procedure to the end of the callback, because the edit undo command might change the position of the insertion cursor. Note that we could have implemented this example also without making use of the undo mechanism for text widgets, by saving the last accepted contents of the widget, along with the cursor position, and restoring them in case any line gets longer than allowed. The resulting script would then run with Tk versions earlier than 8.4, too.